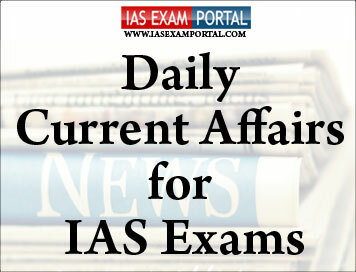 Current Affairs for IAS Exams - 4 September 2018 | IAS EXAM PORTAL - India's Largest Community for UPSC Exam Aspirants. A NITI Aayog constituted group of experts has urged the government to set up a dedicated mission to salvage and revive spring water systems in the country’s Himalayan States given their vital importance as a source of water for both drinking and irrigation for the region’s inhabitants. Spanning States across the country’s north and northeast and home to about 50 million people, the Indian Himalayan Region (IHR) has been heavily reliant on these natural groundwater sources, that are under increasing threat from the urbanisation caused by a constant push for development and climate change. The extent of the crisis plaguing the mountainous region was recently evident when more than half a dozen districts of Himachal Pradesh and the State capital Shimla faced a severe drinking water crisis this May after major water sources either went fully or partially dry. While poor water management was said to be the key cause, according to State authorities, they also attributed reduced snowmelt and depressed flow from springs as contributors to the crisis. If the draft Charter of Patients’ Rights released by the Union Ministry of Health and Family Welfare comes into force, patients will not just have the right to emergency medical care and informed consent, but will also have the right to non-discrimination, seek a second opinion and choose alternative treatment options, if available. The draft, prepared by the National Human Rights Commission (NHRC), has been put up on the Health Ministry’s website on August 30 for comments and suggestions. According to a notice issued by Joint Secretary Sudhir Kumar, the Ministry plans to implement the Charter of Patients’ Rights through State governments for provision of proper health care by clinical establishments. Although some States have adopted the national Clinical Establishments Act 2010 and certain others have enacted their own State-level legislations to regulate hospitals, there is no consolidated document on patients’ rights that can be followed by all States uniformly. The draft charter that includes 17 rights with description, draws upon all relevant provisions, inspired by international charters and guided by national level provisions, with the objective of consolidating these into a single document. Right to non-discrimination is an important right. Every patient has the right to receive treatment without any discrimination based on his or her illnesses or conditions, including HIV status or other health condition, religion, caste, ethnicity or sexual orientation. The Supreme Court said it was “pathetic” that some States and Union Territories had not bothered to frame a solid waste management policy. The court ordered that further construction activities be stopped in some States and Union Territories that remained unmindful of the interests of their people to live in a clean environment. A Bench headed by Justice Madan B. Lokur imposed fines on some States and the Union Territory of Chandigarh for not placing on record their respective policies under the Solid Waste Management Rules, 2016.While Andhra Pradesh was ordered to pay Rs. 5 lakh, Maharashtra, Madhya Pradesh, Uttarakhand and Chandigarh were imposed costs of Rs. 3 lakh each. In case the States have the interest of the people in mind and cleanliness and sanitation, they should frame a Policy in terms of the Solid Waste Management Rules so that the States remain clean. The attitude of the States/Union Territories in not yet framing a Policy even after two years is pathetic, to say the least. Further constructions in the States/Union Territories are stayed until the policy is framed, supreme court observed. “The IO shall, inter alia, examine customer complaints which are in the nature of deficiency in service on the part of the bank, that are partly or wholly rejected by the bank,” RBI said in a statement. The instructions are not applicable for Regional Rural Banks sponsored by commercial banks. As banks should internally escalate complaints that are not fully redressed to their respective IOs before conveying the final decision to the complainant, customers need not approach the IO directly, the RBI said. According to bankers, the Internal Ombudsman Scheme of 2018 mandates banks to grant a fixed term of three to five years, which cannot be renewed, to the IO. The IO can be removed only with prior approval from RBI. The remuneration would have to be decided by the customer sub-committee of the board. The President of India, Shri Ram NathKovind, reached Cyprus yesterday (September 2, 2018) on the first leg of his State Visit to three European nations – Cyprus, Bulgaria and the Czech Republic. He addressed the members of the House of Representatives of Cyprus in Nicosia. Speaking on the occasion, the President said that relations between Cyprus and India are old, deep and have multiple facets. As ancient civilisations, our first priority is our people. The strong connection between the citizens of Cyprus and India is the most important source of our bilateral energy. From people-to-people contacts, we build economic and trade links, educational and intellectual connections, and a fruitful bilateral partnership. Then of course are issues of common concern and our mutual commitment to peace, security and sovereignty. This takes us to the multilateral sphere and to global matters, where inevitably we find ourselves on the same side. The President said that India’s overriding mission is its economic growth and modernisation, with the fruits of development reaching all sections of our people. Cyprus, as a trusted partner and as one of the largest investors in India, is critical to this process. India is at an exciting juncture and offers appealing business opportunities. Speaking on the occasion, the President underlined the common values that mark India-Cyprus relations. India is the fastest growing major economy in the world, he said. This opens up opportunities for investments for Cyprus. Cyprus should look at not just portfolio investments but enter sectors such as infrastructure, real estate, renewable energy, pharma, wellness and healthcare. In his inaugural address at the Forum on China-Africa Cooperation (FOCAC), President Xi Jinping was authoritative in messaging that Beijing had become the locomotive of Africa’s all-round progress. Among the eight verticals flagged on Monday, President Xi highlighted China’s intent to set up additional economic and trade cooperation zones to promote industrialisation in Africa. Local currency settlements, instead of hard currency usage such as the U.S. dollar, would be encouraged to settle transactions. The Chinese have taken umbrage against allegations of involvement in “debt trap” diplomacy by saddling smaller countries with unplayable loans and using them as levers for political gain. President Xi stressed that out of the $60 billion that were on offer, $15 billion would be disbursed as aid, interest-free loans and concessional loans. Mr. Xi said 50 China-Africa security assistance programmes will be launched under the flagship Belt and Road Initiative (BRI). He also flagged a China-Africa “green envoys programme” that would muscle Africa’s capacity for environmental management, pollution prevention and control, as well as green development. President Xi also announced that China will train 1,000 high-calibre Africans, provide 50,000 government scholarships, sponsor seminars and workshops that would benefit 50,000 Africans, and invite 2,000 African youths to visit China for exchanges. The bacteria, known as Staphylococcus epidermidis , is related to the better-known and more deadly MRSA superbug.It’s found naturally on human skin and most commonly infects the elderly or patients who have had prosthetic materials implanted, such as catheters and joint replacements. The researchers found that some strains of the bug made a small change in its DNA that led to resistance to two of the most common antibiotics, often administered in tandem to treat hospital infections. Another Australian study, published last month, suggested some hospital superbugs are growing increasingly tolerant to alcohol-based disinfectants found in handwashes and sanitisers used on hospital wards. “This highlights that the use of more and more antibiotics is driving more drug-resistant bacteria,” They said. Alastair Cook has announced his retirement from international cricket, with the fifth Test against India at the Oval set to be his last. The 33-year-old opener is England’s all-time leading run-scorer and the sixth-highest run-scorer in Test history. Cook has played 160 Test matches, with 12,254 runs to his name. He made his Test debut in Nagpur in 2006 at the age of 21, and scored a century in the second innings. He played a key role in England’s historic Ashes win in Australia in 2010, scoring 766 runs. Two years later, he led from the front as England won a Test series in India after 28 years.